The enterprises, as we know them, are renewing itself, all thanks to the phenomenon known as the gig economy. America is on its way to establish a gig economy, and estimates show as much as a third of the working population is already in some gig capacity. From flexible hours to the ability to work from anywhere, the gig economy is attracting more and more people, and it’s no wonder. There are 56.7 million freelancers in the United States. According to a 2018 survey of 6,000 U.S. workers by Upwork and the Freelancers Union, freelancers represent one in three U.S. workers (35 percent) with an increase of 3.7 million in the past five years. Experts expect this working number to rise. A recent Forbes study revealed that, based on the current growth rate, freelancers are expected to become the majority workforce by 2027. In the modern digital world, it’s becoming increasingly common for people to work remotely or from home, mainly due to automation, freedom, and flexibility factors. What Factors Contribute to a Gig Economy? In today’s gig economy, a job for life is no longer an option, except for perhaps some civil servants, medical doctors, and police officers. Even in medicine, the number of locum doctors and nurses in the US and the UK has increased dramatically over the past ten years. In its earliest usage, gig work referred to jazz club musicians in the 1920s. Some features, such as the fact that workers do not get healthcare, pensions or paid holiday, have hardly changed since. Many of gig economy jobs don’t require the freelancer to come into the office to work, which facilitates independent contracting work. Employers also have a wider range of applicants to choose from as they don’t have to hire someone based on their proximity. Additionally, computers have developed to the point that they can take the place of the jobs people previously held. On the side of the employee, people often find they need to move around or take multiple positions to afford the lifestyle they want. People also tend to change careers many times throughout their lives, so the gig economy is the reflection of this occurring on a large scale. What does the Growing Gig Economy Mean for the Workplace? Beyond figuring out your lifestyle priorities, to be successful as a gig economy worker, you’ve got to cultivate the right set of skills. What differentiates a gig worker from others is that gig workers are very, very portable. Their skills are portable. Many of those skills revolve around technology. It’s skilling, reskilling and upskilling, particularly for those who comprise the gig economy — freelancers, independent contractors and professionals, consultants, side giggers and more. Not only that, but technology also makes it easier to find work. According to stats, 64% of freelancers found work online. In a gig economy, workers who try to earn a steady income through short-term contracts have to find another gig as soon as their current one is completed. This sometimes means juggling several jobs at the same time. Tykecia Hayes, a freelance filmmaker in Los Angeles, takes on gigs that include helping people move, making deliveries, or working as a personal assistant. However, there is another side of the coin. Not having a boss means you have to find your own paid work. There’s no guaranteed income, which means that you create your own safety net. Thus you have to be a darn good hustler and money manager, too. Flexibility. Workers are often given the flexibility to work from a remote office, or from home. Independence. This can be a great confidence booster, and give workers the ability to complete a job the way they believe is the best, on their timetable and in their way. Lifestyle. You can schedule your work around your personal commitments. Variety. Instead of similar, monotonous tasks to be done each day, each project may be filled with different elements that make the work interesting. Networking. Work won’t turn up at your doorstep. You’re going to be hustling for it, and networks will remain critically important. Set up a website, social media accounts, or a blog. Get out there and market yourself. Uncertainty. To get consistent pay you will need to have a steady stream of jobs. Personal Expenses. Most companies won’t remove taxes from your paycheck for you. That means paying taxes is something you’ll have to plan for. No Benefits. Gig workers do not usually get benefits that are paid for by the employer, such as health insurance, contributions to retirement plans, annual leave, and sick leave. Isolation. While this adds flexibility, it can also cause isolation from the other workers and the feeling of being removed or left out. Lower cost. They are allowed to cut costs, and just pay for the actual labor that a freelancer gives. Ability to scale quickly. Without the need to provide office space, equipment, and benefits, small companies simply need to find people who have their own computer and are able to do the work. A diverse pool of flexible workers. Gig economy workers are often various ages and skill levels, and businesses can utilize workers for different projects based on their skills. Less reliable workers. Employers should be thorough in setting up expectations and in selecting freelance workers to ensure they will have a reliable employee. Tight regulations. There is often paperwork that needs to be filed and income information that is different from regular, which can be a bit of headache for businesses to navigate. 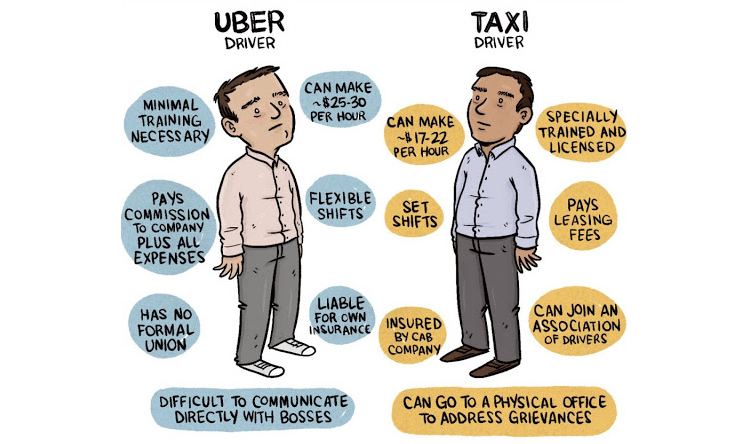 Gig Economy = Share Economy? Gig and share economy are two totally different worlds. In the latter, the principle is to share a good; in the former, people do a job using their own means and earning payment for it. In other words, the gig economy stands to the sharing economy as Uber stands to BlaBlacar. Those are the two most prominent players in this field. There are plenty of stories out there claiming that Uber drivers and Airbnb hosts earn six figures per year. There is a wide range of positions that fall into the category of a gig. Some jobs are more commonly advertised as gigs than others. Jobs that involve a single task, such as writing a business plan, are ideal gig-type positions. Any work in which people may be hired for on-demand tasks has the potential for gig employment. Examples include graphic designers, drivers, technical writers, photographers, construction workers, painters, musicians, delivery personnel, web developers, craft and fine artists, software developers, carpenters, interpreters, translators, and computer programmers. Why pay someone to sit at a desk waiting for a chance to shine when you can instead divert that money toward people with relevant experiences and credentials? 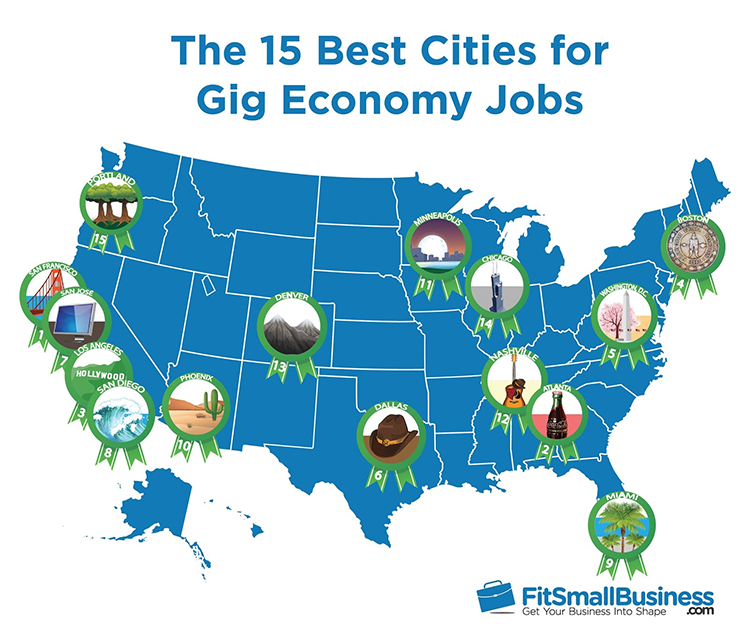 Cities tend to have the most highly developed services and are the most entrenched in the gig economy. Due to the large numbers of people willing to work part-time or temporary positions, the result of a gig economy is cheaper, more efficient services, such as Uber or Airbnb, for those willing to use them. While it’s better suited for jobs that can be performed digitally, the brick and mortar side also benefits greatly from it. However, those who don’t engage in using technological services, tend to be left behind. In sum, one is for sure — by embracing this trend and changing the way we think about work, workers and businesses can all benefit. Instead of fearing the structural changes on the horizon, seize the opportunity to get ahead of the curve and take your career to the next level!